Beta Beta Beta Biological Honor Society is a society for students, particularly for undergraduates. It seeks to encourage scholarly attainment in this field of learning by reserving its regular membership for those who achieve superior academic records and who indicate special aptitude for and major interest in the natural sciences and to promote a better appreciation of the value of biological study and thus welcomes into associate membership all those students who are interested in biology. Beta Beta Beta also endeavors to extend the boundaries of man’s knowledge of nature by encouraging new discoveries through scientific investigation and to this end encourages undergraduate students to begin research work and report their findings in the journal findings in the journal of the society, BIOS. Click here to see a listing of Beta Beta Beta Members. From left to right: Bryan Martin, Danielle Lazzara, Christine Dugan, Afroditi Emporelli, Vincent Marchese. 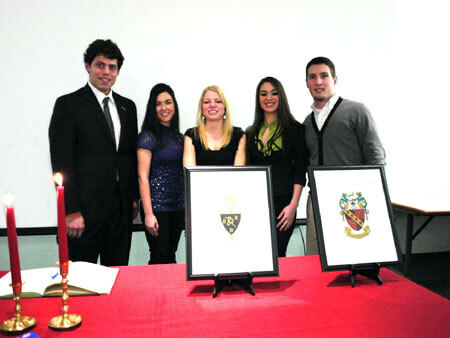 In front are the Seal and Coat of Arms for the Beta-Beta-Beta honors society. Christine Dugan at at her induction into Tri-Beta, April 2011. 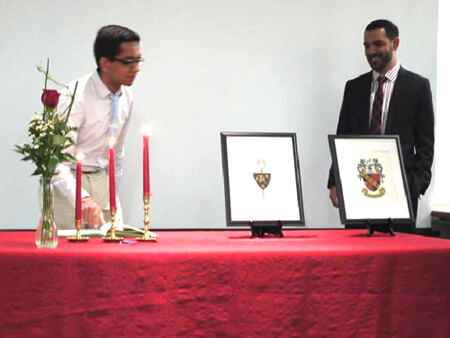 From Left student Dharm Patel at his induction into Tri-Beta, April 2011. Faculty advisor Pedram Daneshgar looks on.